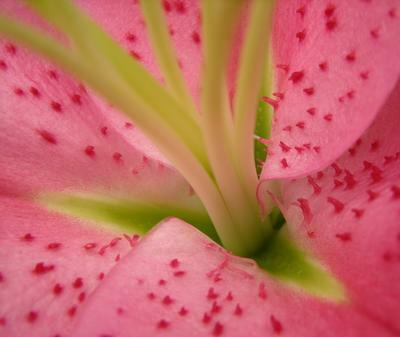 This is an Oriental Lily, the most famous of which is Stargazer. (I'm not sure if it is a Stargazer or not.) Most people are familiar Orientals and their stunning colors. What most people don't see is the detail that is way down inside. Once you get past the initial beauty of the color and begin to look further, you find there is whole world of detail and color "deep down inside." I think the color is nice, and the idea is good. Problem is the photo is too close. I wish I could see more of the flower, it just shows most of the centre. Disappointing.